Squirrels, one of the most common rodents in the U.S., inhabiting rural, suburban, and urban areas, are active throughout the day. Although they’re found in trees and wooded areas, they don’t hesitate to get comfortable in garages or attics, even nesting to nurse their young, when there’s a good opportunity to take shelter and store food. It’s not uncommon for squirrels to dig up gardens, especially when there are fruits or vegetables present. They’ll also tear up bark on trees or plants and gnaw on electric wiring, cables, sprinkler heads, and other items on or near a home. Squirrels tend to find their way within walls and above ceilings and they can often be heard from these places running and scratching during the day. In addition to these noises, chewed up wood, drywall, or electrical wires could also be signs of a squirrel infestation. If you notice any of these signs, make sure to contact Groen’s Wildlife immediately for our trapping and exclusion services before they cause further damage. If you find squirrels living in your attic, basement, or crawlspace, the safest and most effective way to remove them is by calling a professional for trapping services. It is especially important to have a professional deal with squirrel infestations in the spring or fall because one of the squirrels in your home could be a mother. When we trap squirrels, we check to see if it is a lactating female and if so, we must find and remove the babies since they cannot leave their nest without their mother. The professionals of Groen’s Wildlife Services have the training and experience to effectively trap and remove squirrels from your home or property. Our methods are humane and safe for the animal and we guarantee complete removal. We also provide deodorization and feces removal and we will close off the entry point and repair any damage the animal caused to your home. 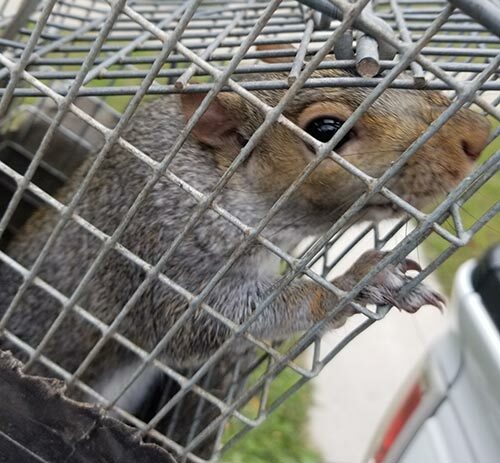 Contact Groen’s Wildlife Services if you find a squirrel in your home; we provide squirrel removal services to Northwest Indiana and the Chicago suburbs.